got milk? maybe not . . .
Moooo . . . isn’t she cute? Big smooch! A couple of years ago, I thought I might have a problem with the protein in milk (casein), which sometimes occurs when you have celiac disease and you’re not breaking down your food properly. Casein is molecularly similar to gluten, so it is believed to illicit a negative response in some people. I went totally dairy free (none, zip, zilch) for over a year. Then I decided to ease back into it and before I even had time to reintroduce words like fromage back into my vocabulary, I was eating chunks of camembert with pecans, grating a nice parmigiano reggiano on salads, or topping beefsteak tomatoes with buffalo mozzarella and fresh basil. Not to mention daily doses of my all-time favorite treat, vanilla goat yogurt. I slid right back into drinking milk and eating dairy products like there was no tomorrow. Darn it – it’s not working so well for me now so I’m back on the dairy-free bandwagon although I may consider dabbling in raw milk as an alternative. What’s the deal with dairy, anyway? If you want some answers, grab a cup of green tea, because my friend, Daisy, is going to clear a few things up for you. We’ll start with the basics. Lactose is the sugar in milk. It’s a disaccharide (double sugar) composed of glucose and galactose linked together. Lactase is the enzyme that breaks this double sugar bond and if we don’t produce enough lactase to break the bond, we can’t absorb the sugars. Single sugars we can deal with, double sugars are too big to be absorbed. If these disaccharides aren’t absorbed, they end up as tasty treats for the bacteria housed in the digestive tract – and this bacterial frenzy causes all kinds of intestinal discomfort. After about the age of 4 or 5 our production of the sugar splitting enzyme (lactase) declines dramatically – for most of us anyway. And if you have celiac, it makes breaking down sugars even harder (there’s a reason for that but I’ll save it for another post). So, although gluten, casein, and lactose are all different substances, there are reasons each can cause problems for people with celiac or gluten-intolerance. In addition to lactose, cow’s milk also contains several different kinds of proteins that can cause reactions in people sensitive to them. These proteins may register in the system as “foreign” substances and cause an immune response. If you already have an immune mediated response to gluten – these proteins may be bothersome as well. 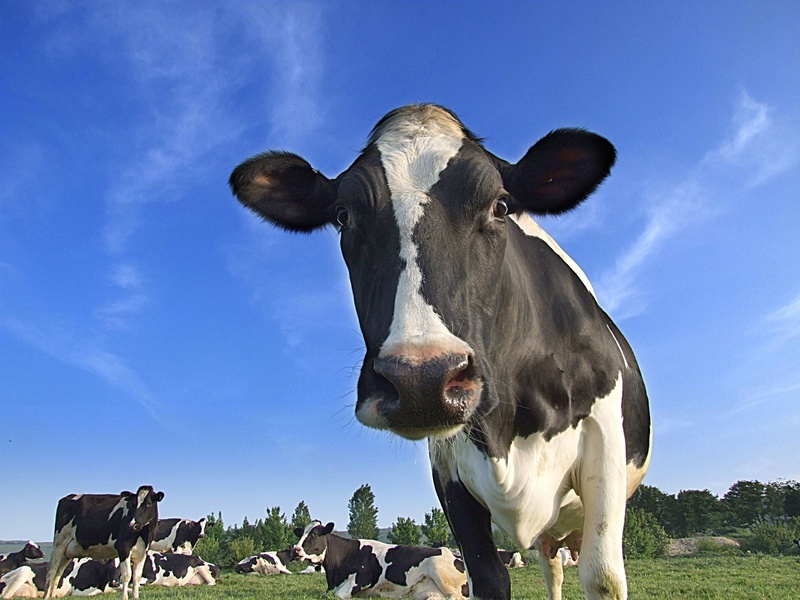 Here are some dairy-related definitions that will help you understand this big milky picture. Lactose intolerance: a condition that results from an inability to digest the milk sugar lactose; characterized by bloating, gas, abdominal discomfort, and diarrhea. Casein: a protein found in milk. It has a molecular structure that is similar to gluten and can cause an autoimmune response in people sensitive to it. Casein is the curd portion of curds and whey. Casein intolerance is different from lactose intolerance. Whey: the liquid protein portion remaining after milk has been curdled and is used in the production of ricotta and brown cheeses. Whey is thought to be a migraine trigger in certain people. Rennet: enzymes produced to digest mother’s milk (all mammals produce this enzyme). Rennet is used in the production of cheese. Another concern is the potential connection between ovarian cancer and high lactose intake. A November 2004 article in the American Journal of Clinical Nutrition suggests a possible relationship between high intakes of milk products and a specific type of ovarian cancer. More studies are needed to quantify this relationship, but it’s certainly something to think about if you have a strong family history of ovarian cancer. And is it the milk, or the processing and additives involved that cause the problems? The relationship was NOT made between raw milk and ovarian cancer. Something else to think about. Consumer’s have been conditioned to believe we “need” to eat dairy products to maintain strong bones and enjoy optimal health. The Dairy Council is hard at work trying to convince us that we need several servings per day of dairy products to obtain the necessary calcium and nutrients for overall health. You know – the whole “Got Milk” campaign. Well, that’s not necessarily true. With a little effort and a lot of knowledge, we can get plenty of calcium from other food sources. And if absolutely necessary, calcium supplements are also an option. I have to say, I feel more vitality and a decrease in joint and muscle aches and pains when I exclude dairy from my diet. And as I said, it could be the types of dairy products I’m choosing, but I do believe it’s the casein that causes an immune response in my system. We each have to figure out what works best for us – for health and for ethical reasons. Raw milk and cheese may provide an alternative for people who have “issues” with dairy products. Cared for and pastured animals, grass fed and free of antibiotics and hormones, produce nutritious milk. Evidence has shown that high quality raw milk may be a good alternative for those suffering from lactose or casein intolerance. Pasteurization and the way the animals are treated (drugs, factory farms, grains, etc.) may be the culprit rather than the milk itself. In the meantime, here’s a list of calcium-rich food sources for those of you who don’t eat dairy for whatever reasons. Many of these foods also contain other nutrients that play a role in bone health (magnesium, phosphorus, zinc, copper, boron), so add them to your shopping cart to boost overall health! This entry was posted on Monday, March 24th, 2008 at 1:03 pm	and is filed under Celiac & Gluten Intolerance, Nutrition Therapy. You can follow any responses to this entry through the RSS 2.0 feed. You can leave a response, or trackback from your own site. Very informative! I’ve always been a dairy consumer since a little boy. I love yogurt and all cheeses (except goat, blue and feta) and used to drink over a quart of skim milk every day. I was always curious about people who were lactose and how it came about. Some people develop it over the years, but I always wondered whether or not I’m increasing my chances of being lactose by eating so much dairy. Similarly, I was always curious if eating too much sugar can essentially give you diabetes. Good info, thanks! Another great post, Melissa! I used to be such a dairy fiend. I remember when I studied abroad in Australia I would eat ice cream — in some form, everyday. I also remember when I discovered my gluten intolerance and told people, they would say “well, at least you get to eat ice cream still!” That was before my casein intolerance was diagnosed. Dairy used to mean a lot to me, but after the initial few days of cravings, I got over it pretty quickly. I do however, terribly miss the tang of yogurt. That’s great news about your joints and muscles. I definately notice that while my family and friends have had their share of the sniffles this winter, I haven’t had one cold. Any clue if this is related to dairy consumption? Very informative! I cut out dairy when I first went gluten free and whenver I want to detox a little ( ie lose weight!). I love dairy products but can go with out fairly easily. My sister can’t do dairy so I am going to be working on some dairy free recipes for her. Great info, thanks! Melissa, this is a great blog! I’m learning so much…even after all of my nutrition classes! I’m in Colorado too, so that makes it more fun! Hey Nick — yes, eating too much sugar and processed foods does contribute to type II diabetes, but if you’ve been eating that much dairy with no problems, you must have good dairy genes! You are probably one of those people who produces plenty of lactase to break down the sugar in milk. Lucky boy! Lizzie — where in Australia? I know what you mean about getting over the dairy. After a while it’s just not a big deal, but I do eat a little vanilla goat yogurt on occasion. Not often, but I LOVE it. Tiffany — where are you in Colorado? And where did you take your nutrition classes! Nice to meet you! I’ll go check out your blog. Melissa, thank you! I am sending your post to my parents. Fantastic info and very succinct. I actually learned stuff I didn’t know I thought I knew all the dairy free quizzlets, but alas you have trumped me, hehe. I miss your blog! I miss my blog, lol. One of the worst experiences I had @ UNC medicine (with student health which is notoriously poor) was with their super duper nutritionist. I was mandated to go see her by my GI and parents… we spent the entire time arguing about how my bones would break and I can’t possibly get enough calcium if I didn’t eat dairy! Talk about frustrating… I sited off the broccoli statistics, etc but to no avail. Apparently she worked for the dairy co’s also Her next best suggestion (besides realizing I was lying about not wanting dairy, of course) was to eat sardines and canned salmon with bones. I already did that, so that was ok but I was so mad I never went back and started devouring nutrition info on my own. Then along came your blog and I was in heaven (was? is, sorry). You’re such a blessing, keep posting and making my day! I’ve neglected my blog and neglected checking out everyone else’s lately. Sometimes life takes us on diversions and we just have to go with the flow! Thanks so much for your comments. Interesting story about your nutrition experience at UNC. I just know I do better if I skip the dairy. It seems that maybe the ones most suited to cow’s milk are baby cows. I don’t have the answer by any means, but this is what works for me. And if you read some of the research about Asian women and osteoporosis, you find they have a much lower incidence compared to western countries and they don’t eat dairy at all. But they do eat lots of fish, like you mentioned. Along with other sources of calcium, phosphorus, magnesium, etc. It’s our lifestyle (SAD – Standard American Diet) — we eat lots of junk food, processed and refined foods, drink soda pop, etc. Not good! I have a wonderful salad recipe for canned salmon and if you crunch up the tiny bones and mix them in you get a good dose of calcium (I’ll post that one of these days). Also weight-bearing exercise is SO important for bone strength. Get yourself in a yoga class that does inversions and downward facing dog and things like that. Where you put stress on your bones from all directions. Sounds like you’re doing all the right things, Cindy. You know more about nutrition than your UNC nutritionist! I’m glad you understand about life getting in the way of the blog sometimes. I’ve been meaning to email you , but it seems that after moving my brain stopped! I’ll email you soon. Link away — that would be great! Yes, eczema and skin rashes can definitely be the result of dairy products in some people. Yuk, I know what you mean. As for life trumping blogging, not much you can do about that. My mom was in the hospital and when it comes down to it, there’s no question as to what’s more important. And it’s hard to move and blog at the same time! You need to get settled, then get back to it. The internet can wait, it will still be there when you finish unpacking! Take care and I’ll “talk” to you soon! Loved the post but then again I am biased having realised 20 years ago the reason why I had a cold or respiratory infection every month, let alone the gut upsets, was because I am allergic to casein and lactose. I grew up in NZ where it was your patriotic duty to get through kilos of cheese a week and eat half a sheep. I hated the smell and flavour of milk which most dairy intolerant people do, but change the flavour with salt to make it cheese or combine it with sugar and chocolate and turn it into icecream – and I’d become addicted. I can cope with a bit of butter but that is all these days. But feeling well more than makes up for it. Most of my glutenfree recipes are also dairy free if you are looking for more ideas. As for calcium – I love hummus, tahini and add nuts to my cereal and salads. I have been known to eat nut paste (almond spread etc) with a little mayo on rice cakes for a snack. Am still one of those strange people who love tofu (you can hide it by crumbling some into scrambled eggs for those who think it’s boring) and tempeh. Canned, organic beans are also a saviour. AOF — as I understand it, casein can cause problems in sensitive people. My son has spent lots of time in NZ and says the same thing about the cheese and sheep. He’s also been to Australia a bunch and moans and groans about the fact that you guys put beets on everything. I LOVE beets! I’ve been thinking about doing a post dedicated to that wonderful, crimson veggie. I might have to check with you and Lucy for ideas. Try the almond butter (I assume that’s your almond spread — ground up almonds?) on sliced Fuji apples. That is a daily ritual for me. Yum. I know you have some good GF/CF recipes on your site! I’ve used some of them — thanks! Melissa, I took nutrition classes at culinary school a while back. I would love love love to go back to school to become a nutritionist, but unfortunatly I dont forsee it in my cards Anyhow, I live in Aurora. What part of Colorado are you in? It’s always fun to find bloggers who live close by! Where did you go to culinary school? I’m in Golden — do you own/work in a bakery? A GF bakery? Oh, that would be nice! Take care and let’s keep in touch. BTW, that polenta-skillet-pie on your website looks wonderful. I’ll definitely try that! Love your blog, very informative and entertaining, I will be back often. Thanks for this informative post. I am lactose intolerant. I think also that I am one of those people that are naturally not big on dairy so being lactose intolerant never makes me feel deprived of certain things. When I desire to eat or drink something that contains dairy, I take a supplement that will aid in the digestion. I went to the California Culinary Academy in San Francisco for Baking and Pastry Arts. I used to work as the assistant pastry chef at Restaurant Kevin Taylor downtown, but have since started working as a personal chef/caterer and a wedding cake baker. I am still working on finalizing my GF cake formulas, but soon they should be ready I hope to eventually open a store front-but that wont be for a while. If you are looking for GF bakeries, there is one in Denver called Deby’s Gluten Free (changing their name to 8 free foods). I’m sure you are aware of them. They are expensive and the restaurant food is not always a 10, but their baked goods are convienient and pretty tasty!! I like their lemon bars. Thanks Karen! I appreciate the comment. Hi Cynthia — yes, I love your blog! Great stuff! Hey Tiffany — I’m having problems leaving comments on your blog. I’ll have to figure that out. In the meantime, were you at the GF Baking Invitational at Johnson & Wales last weekend? I did a nutrition presentation and thought I saw someone with a “Tiffany” name tag on, but I was in the midst of talking with someone else and couldn’t switch gears and run her down. Was that you? Hurry up and open a GF bakery here in Denver! Aw man!! I didnt know there was GF baking invitational going on!!! Shoot! Unfortunatly I was not the Tiffany you saw…too bad! I would have loved to have gone, though! Is there a website I can look at to find out about these events? I met this lady who my mother in law knows that has owned bakeries in the past. Once I get my recipes all straightened out, we are talking about opening something up in the future. She’s got the business experience, and I have the food experience…this could be exciting! Thanks for an informative post, Melissa. I am lactose-intolerant (though I do not have celiac disease), and I think it’s important for people to know that they can get adequate calcium by eating calcium-rich plant foods and soy. Also, I look forward to your participating in my Beautiful Bones event. quick question – have you ever made your own yogurt with a GFCF starter? Thanks SO much for your kind words. I really appreciate it. I’m aware of Sweet Escapes as I saw Melissa and her daughter Ashley do a presentation at the Gluten-Free Baking Invitational at Johnson & Wales University last spring. I also did a presentation on boosting the nutritional value of GF baked goods. I’ve never been to the bakery though. It does sound wonderful. I haven’t made my own yogurt — at least not in many, many years. I used to do that in my hippie-girl days. I want to get back into it and plan to one of these days soon. I’ll keep you posted.